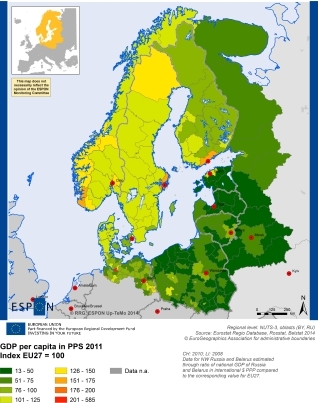 Data used as provided from data sources for ESPON countries. Data for NW Russia and Belarus estimated through ratio of national GDP of Russia and Belarus in international $ PPP compared to the corresponding value for EU28. The indicator is available annually for the time period 2001-2011; available for EU28, Iceland, Norway and Macedonia, for Turkey and Switzerland. Estimated data for Russia and Belarus for 2010 and 2011 only. Annual updates available from Eurostat, although with certain time lack. Data available at NUTS-3 level and higher (Turkey: NUTS-2 level). NUTS-3 preferred spatial level.